The best part about this week’s Turn on the Oven Tuesday is that I didn’t have to do anything. Lucky for me, my mother-in-law is in town and taking care of all the meals. 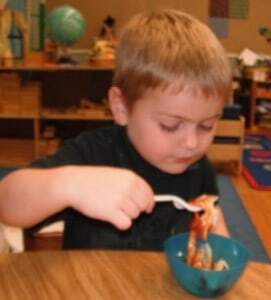 A special request from Joe was to have her make pasta at preschool again this year. I’d like to give you the recipe, but my mother-in-law just dumps together some flour and some eggs and some oil… and suddenly there are homemade noodles. It’s like magic. If you are like me, and like clear instructions on what to do, you can check THIS out. Or, you can try and follow my mother-in-laws magic recipe. For 15 kids, she used a dozen eggs, and 3/4 to 1 cup flour per egg, and mixed them together. She added about a tablespoon of oil, to make it more easy to work with, and about a teaspoon of salt. 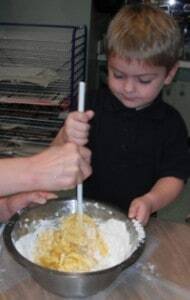 She had the kids help stir the mix and added more flour until it was workable but not too stiff. The next step was to knead and knead and knead on a floured tabled until all the lumps were out. 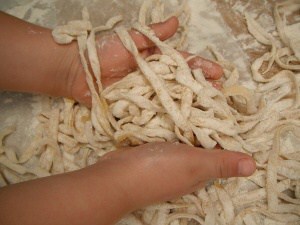 Once everyone was sufficiently covered in flour (and the lumps where gone), the dough was divided into small sections and fed through the pasta maker. 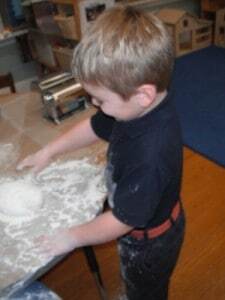 The kids first flattened the dough with the pasta maker, and then they added more flour to the outside and fed them through the noodle side of the pasta maker. 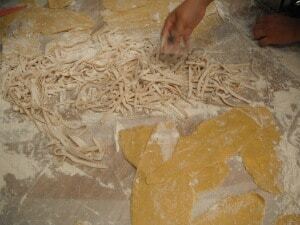 The noodles were then dropped into the boiling water with a little oil. The oil keeps them from sticking together. At preschool we did this on a hot plate. 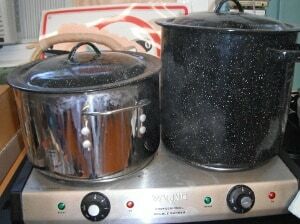 Getting the water to boiling took a while, but worked just fine. After about 8 minutes we checked the noodles. After a few minutes, we drained the water and served them to the kids with a little red sauce. Every kid ate a bowl full and most came back seconds or thirds. 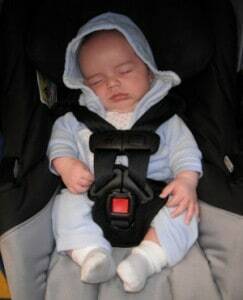 And in case you are keeping up with James, he was there too… but slept through the whole production.